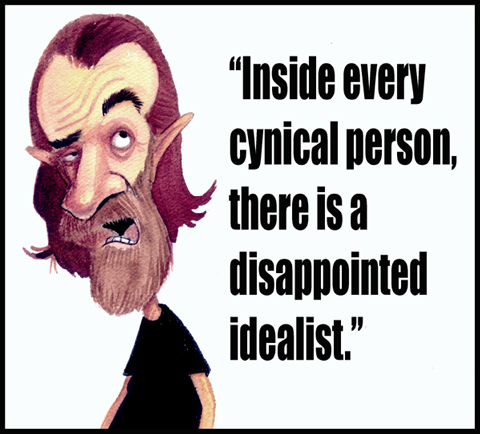 NOTE: I happen to prefer the '70's George Carlin. I'm with you on that one John. It's like he forgot about humor later on and devolved into sarcasm. George had a propensity for cutting through the BS and seeing the absurd that was right in front of our face....and it was funny. I loved him until the last several years (as John said in the 70s) where he, and a lot of stand ups, just got so progressively political. Can hardly watch them anymore. I still think we lost a good one. (The 70s version). Me too. In many ways. It seems to happen to most of them. Robin Williams who used to be pretty secure in the middle of the A list is an intolerable bore now. It must be awful to have your livelihood dependent on public adulation--walking the line (& at some point believing you have to cross it) between clever & insightful (perhaps even appropriate) & over-the-top (perhaps "whoring yourself" to a public you've learned isn't so bright). I meant George Carlin, Eddie Murphy, Robin Williams, etc.--entertainers--not real artists. Adulation comes at a price. Self-deception is inescapeable. This page contains a single entry from the blog posted on March 27, 2009 8:41 PM.